The new run screen allows you to show the entry grid in either horizontal or vertical mode (on right). Horizontal mode (same as QC-Gage 3.0) shows the grid with the parts represented in rows. Dimensions are columns. In Vertical mode, the parts are columns and the dimensions are rows. This is advantageous if you are using a checklist for measurement and there are a lot of dimensions. All measurements and factors are now in one interactive data collection grid. Values are then color coded in the grid to either green (in spec) or red (out of spec) for each identification. This keeps the measurement process focused and much simpler. Spec plans can now pull back measurements from QC-CALC that were already committed and display them in the run plot as black read-only points. 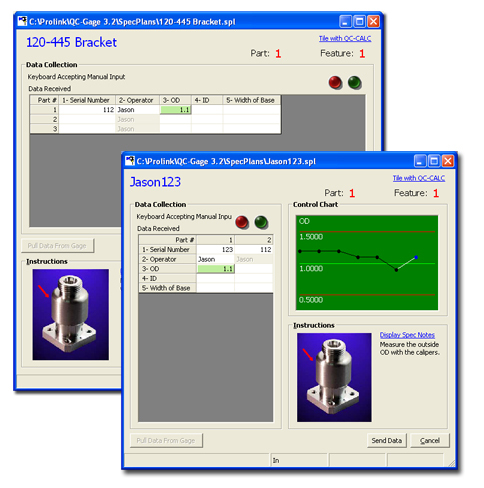 This allows you to see the history of your features as you measure new parts. When you take measurements, QC-Gage immediately moves to the next measurement by default. When this happens you may not see the result in the plot before it switches to the next plot. To address this, we have added an optional delay of up to 3 seconds before moving to the next measurement. This allows you to quickly see the effects of the measurement before proceeding. All spec plans are automatically saved locally each time a measurement is received. If something goes wrong in the middle of your measuring, you can always recover the measurements you took before the problem.